What do bacteria, soil, and gravity have in common? They are all environmental factors and natural processes that help your septic system do its job of processing waste and treating wastewater. Without them, untreated water released back into the water table contaminates your community. While we know how to keep the bacteria in our septic tanks healthy, and gravity works on its own, what about the soil? 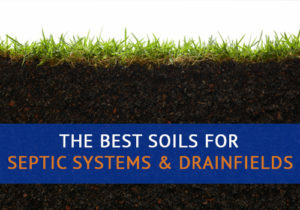 What are the best soils for septic systems and drainfields? Along with other regulations like setbacks, tank capacity and lawn size, soil requirements and soil types can make or break your septic system installation. And it’s not just one or two factors—there are several that go into deciding if the soil in your yard is sufficient enough to support a septic system and drainfield. Over time, soil structure changes from natural processes like wetting and drying and freezing and thawing. These processes create pores and spaces in the various layers of the ground. Pores create the space for downward movement of water and air without being blocked. Ideally, soils for septic systems should have large quantities of pores and spaces that are interconnected (not lone pockets). Is the soil coarse or gritty? Will the soils absorb too much water? Is it heavy or light? The texture of the soil determines how much sand, silt, and clay are present in the ground. Too much clay means the soils are too heavy. Too many heavy silts mean a less porous ground. Not a precise definition or classification, drainage refers to the soils natural ability to drain water from the area. For testing, examine the soil’s moisture levels before any land modifications on a typical day (don’t test the day after a hurricane or massive storm comes through). One way to immediately classify poor-draining soil? If your yard has frequent depressions or puddling, you probably don’t have the best soil for septic systems. While not directly related to soil quality, a steep slope won’t give even the best soil a chance to percolate and treat wastewater before it reaches the groundwater system. How Do You Test Soil for Septic Systems? The percolation test or deep hole tests. Deep Hole Tests are exactly what they sound like—tests using a deeply dug hole. Typically the holes are about seven-to-ten feet deep and below the bottom of potential drainfield locations. Testers collect soil samples and study the seasonal high water table height in relation to the depth of the soil above it. Percolation testing requires two or more holes, which are typically a half-a-foot to a foot deep—the depth of average leach fields. After filling the bottom with clean gravel, fill the hole with water and record how quickly the water drains. Percolation requirements vary locally, even county to county and town to town. But, typically the minimums are around 5 minutes per inch and the maximums around 30-45 minutes per inch. Non-Retentive or Non-Absorbing Soils. Soils like clay and silt absorb water readily, taking up more space and clogging the system. The ideal soil? Somewhere between gravel and clay. Worried your soil isn’t up for supporting septic systems and drainfield? Contact Advanced Septic Systems today and talk about the options and systems that will work in your yard.